DENVER, CO – The list of beers that will be poured by 50 of America’s top craft brewers at the Denver Rare Beer Tasting VII has been released by Pints for Prostates. The prostate cancer awareness event will be held on Sept. 25 in Colorado during the same weekend as the Great American Beer Festival. VIP tickets for the event sold out in less than three hours, but a very limited supply of general admission tickets are still available for the tasting. 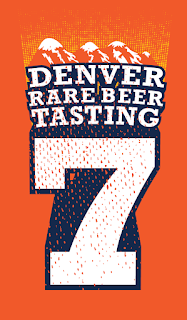 The Denver Rare Beer Tasting VII features rare, exotic and vintage beers and the opportunity to meet the men and women who made them. Vallum, Avery Brewing, Boulder, Colo.
Barrel 178, Bear Republic Brewing, Healdsburg, Calif.
Bell’s Tawny Port Baltic Porter, Bell’s Brewing, Kalamazoo, Mich.
2012 Oak Aged Cherry Biere de Noel, Big Sky Brewing, Missoula, Mont. Samuel Adams Kosmic Mother Funk Grand Cru & Samuel Adams Utopias, Boston Beer, Boston, Mass. Love Child No. 5 & 2013 Bourbon Barrel Quad, Boulevard Brewing, Kansas City, Mo. Brooklyn Hand & Seal, Cognac Edition (Ghost Bottle), The Brooklyn Brewery, Brooklyn, N.Y.
Bourgogne Blanc, Bruery Terreux, Placentia, Calif.
Pumpkin Smash & White Raspberry, Cascade Brewing, Portland, Ore.
Nightmare on Brett Port Barrel Aged, Nightcap & L'Brett d'Cherry, Crooked Stave Artisan Beer, Denver, Colo.
Collage (Conflux No. 1), Deschutes Brewery, Bend, Ore.
Barrel Aged Palo Santo & Festina Lente, Dogfish Head Craft Brewery, Milton, Del. Mango Tango, Elevation Beer Company, Poncha Springs, Colo.
Firestone Walker XVII & Maltose Falcon, Firestone Walker Brewing, Paso Robles, Calif. Bourbon Barrel Aged Sexual Chocolate, Foothills Brewing, Winston-Salem, N.C.
2014 Proprietor’s Bourbon County Brand Stout, Goose Island Brewing, Chicago, Ill.
A Sour Patch Divided, Great Divide Brewing, Denver, Colo.
Once Upon A Time & The Count Whiskey Barrel Aged Russian Imperial Stout, Grimm Brothers Brewhouse, Loveland, Colo.
Ursae, Jolly Pumpkin Artisan Ales, Ann Arbor, Mich.
Cable Car, The Lost Abbey, San Marcos, Calif.
Saranac Javanac & Saranac Imperial Barrel-Aged Rye Porter, F.X. Matt Brewing, Utica, N.Y. Whiskey Barrel-Aged Blackberry Barley Wine Ale, New Belgium Brewing, Fort Collins, Colo.
2013 Incorrigible White Sour, New Holland Brewing, Holland, Mich.
2014 Bourbon Barrel and Vanilla Bean Aged Olde Voyager & Between the Berries and Me, NoDa Brewing, Charlotte, N.C. Ignorance is Bliss, Odell Brewing, Fort Collins, Colo.
ProCATstination, Perennial Artisan Ales, St. Louis, Mo. Anniversary Ale #3, River North Brewery, Denver, Colo. Cold Brew IPA, Rogue Ales, Newport, Ore.
Barrel-Aged Rain Check Spiced Stout, Sierra Nevada Brewing, Mills River, N.C.
Fydoor’s Classic, Stone Brewing, Escondido, Calif.
Barrel-Aged Batch 666: Sympathy for the Devil, Sun King Brewing, Indianapolis, Ind. Barrel Aged Balt the More & Barrel Aged Old Pro with Peaches, Union Craft Brewery, Baltimore, Md. Dark Arts: Tequila Barrel-Aged Imperial Stout with Brett and Espresso & Montmarretto: Barrel-Aged Sour with Montmorency Cherries and Almonds, Wicked Weed Brewing, Asheville, N.C.
Tart Project: Saison, Wormtown Brewing, Worcester, Mass. In addition to the beer and silent auction donations made by participating breweries, the Denver Rare Beer Tasting VII is being sponsored in part by DRAFT Magazine and Zenan USA. Additional sponsorship packages are still available for companies that wish to take part in this boutique tasting. Each attendee receives a commemorative tasting glass, t-shirt, program and pen. A buffet lunch is included in the ticket price and guests will have the chance to bid in an exciting silent auction that includes a variety of unique beer experiences and collectibles. The first six Denver Rare Beer Tastings sold out several weeks in advance. The event will be held this year on two floors of the McNichols Civic Center Building at 144 W. Colfax Ave.
All Denver Rare Beer Tasting ticket holders will be entered into a drawing for a 9-night BeerTrips.com organized tour for two from Sept. 21 to Oct. 1, 2016, to Prague, Bamberg and Munich for Oktoberfest. VIP ticket holders will receive three raffle tickets and general admission ticket holders will receive one ticket. Anyone wearing a Pints for Prostates t-shirt or hat to the event will receive another free entry for the drawing. Additional tickets will be available for a donation. The winner will be drawn during the event from tickets collected exclusively at the Denver Rare Beer Tasting. The winner and a guest will travel to Europe on a trip that includes roundtrip airfare from the continental U.S., 9 nights hotel, ground transportation, brewery tours, pub crawls, guided city tours, 9 breakfasts, 4 beer lunches and 4 beer dinners. Complete details on this year’s destination will be announced shortly.